like to order your very own customized Kramer Jigs. Rubber legs are all the rave in steelhead jigs, well we started it and people are catching on. 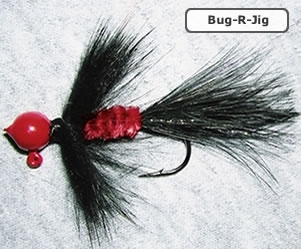 Nothing can compete with a jig that has rubber legs. 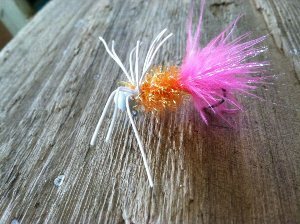 A real fish producer , The TWEAKER has 24 rubber legs with a slender profile, it drives fish wild, it really looks alive in the water. NOTHING OUT FISHES "THE TWEAKER" ! CALL 360-349-3466 TO CUSTOMIZE YOUR KRAMER JIG, TODAY! 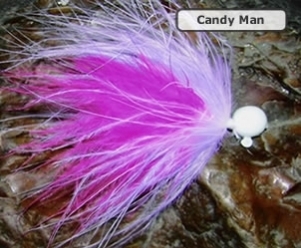 The original rubber legged steelhead jig,our all time best seller! An Amazing Jig! It produces fish when other jigs won't. It's rubber legs squirm and wiggle with the slightest movement. The fish will have no doubt that it's alive, their predatory instincts will take over and FISH ON! Comes in any color combo imaginable! My own twist on the popular Nightmare. With an imitation polar bear tail it holds scent very well. Keeps a large silhouette and you can't forget the good old RUBBER LEGS!!! 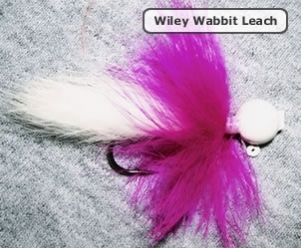 With the life-like movement of the Rabbit Collar and just the slightest hint of flash, this jig does a real number on low clear water fish! With a lone egg swimming behind and a full rabbit body pulsing in front you will see why it is one of our best sellers. 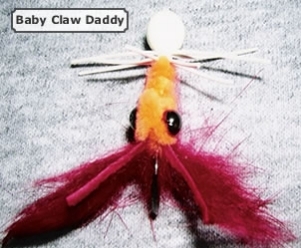 This little crawdad look alike is great for super low clear water.Summer runs go bonkers for the BABY CLAW DADDY.Also great for "float and fly" fishing for smallmouth. My favorite ultra clear water jig really lights up the place. 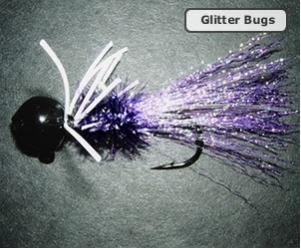 They have a small profile with a ton of flash, throw on the crazy legs and you are good to go.THE GLITTER BUG looks like a neon sign in the water,the fish won't pass this one up! Need we say more? 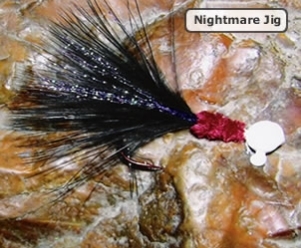 Probably the most popular jig pattern of all time! 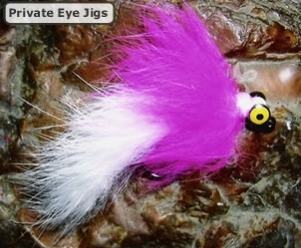 These compact but bulky jigs hold a large profile in the water and really produce fish! I caught my only 30lb stealhead on one. They really soak up the scent and with the crinkle on the tail and the RUBBER LEGS they have fish catching appeal. "THE BOSS" was designed as a summer run jig,and it really did the trick in low clear water.It has been used by many guides to put big numbers of fish on the bank.It also does great for winter run's as well.The hatchery brats eat it up like candy! When it comes to Steelhead you can't forget the pink worm. This Canadian invention has been slaying huge Steelhead for over 15 years. Throw a Rabbit Collar on for more action and you have a real BIG fish slayer. 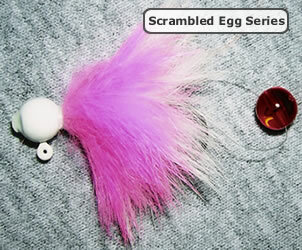 We can tie any pattern that you want on a dumbell head so that it lookes more like a minnow. Works great for Steelies and Float and Fly or Drop Shoting for Bass. 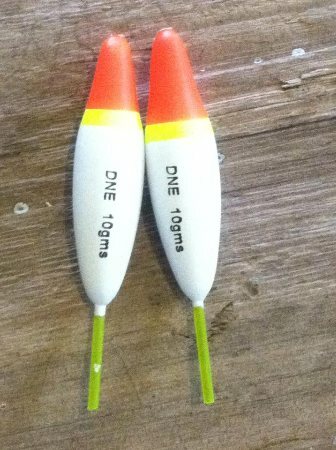 Many flyfisherman use these for steelies!